Every Wednesday morning, as the sun begins to peek between the clouds, local farmers and vendors set up their booths filled with a vibrant array of locally grown produce and carefully crafted, handmade products in USC’s McCarthy Quad. Tasty aromas fill the air as fresh ingredients sizzle on the hot stoves. 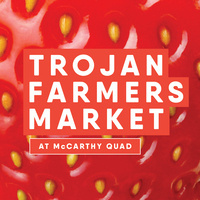 The Trojan Farmers Market is an open-air marketplace that brings fresh, locally sourced produce and goods to the USC campus. When you purchase from the market, you incorporate sustainable practices into your daily life here at USC. Everything here is brought from the farm straight to you! The Trojan Farmers Market now accepts EBT. See the Market Manager for more information.